← Like other ‘girls’, Rosmah likes handbags. What about shoes? COMMENT Every once in a while, we bear witness to incidents that remind us of the complexities of human behaviour. On the afternoon of March 31, 2016, this reminder came in the form of Malaysians clad in red T-shirts, bellowing hateful rhetoric and tired catchphrases. Such an attitude can only be described – at best – as racism on overdrive and stupidity running amok. We know that racism has become a movement in this country – it is methodical and malicious. We see far-right wing groups staging protests to show their abhorrence over ethnic unity, religious diversity and our democratic way of life. To most of us, their acts only confirm the irrationalities of their thought patterns and just how gullible they really are. It doesn’t take a rocket scientist to figure out how ignorance breeds hatred and how hatred breeds violent aggression. But how can we justify the far right wing’s repetitive acts of violence and verbal onslaught? The salvo of unruly, bigoted comments presents something more menacing than sheer ignorance and definitely something that lacks the innocence of your token village idiot. Groups like ‘Gerakan Baju Merah’ display a certain level of emotional investments that reaffirm the anger and resentment they feel are indeed genuine. After all, negative energy is undeniably exhausting and because of this, we cannot simply deduce their inability to accept diverse opinions as a matter of naïveté on their part. Racism, and in our case, institutionalised racism, is often used as a tool to control groups by instilling fear, paranoia and anxiety. After all, these are the recipes used by governments to propagate their indoctrinated hatred over anyone who dares to speak up against corruption and tyranny. And this is what groups like Gerakan Merah present. They see themselves as the last champions of Malay rights and defenders who will do anything to uphold whatever distorted idea they believe in, even if it means wagging unnecessary war against fellow Malaysians or threatening violence and arson. These ideas contradict the spirit of our Federal Constitution and our democratic values. It seems apparent that the only way to break this cycle is by educating ourselves and those around us. Or at least, in the case of Ali Tinju and his band of red clad followers, this could enable them to understand that Malay members in DAP are no longer an elusive, mythical being. Therefore, it is okay to hand over memorandums to any one of us. We are very real and ready to take on those who are bent on destroying the ‘Malaysian Malaysia’ dream. SYERLEENA ABDUL RASHID is DAP Wanita national assistant publicity secretary, Penang DAP assistant publicity secretary, Penang DAP Wanita political education director and MBPP councillor. They insist on a having a Chinese DAP member accept a memorandum against Lim Guan Eng. KUALA LUMPUR: Tempers flared outside the DAP headquarters today when protestors representing the Red Shirts movement refused to hand over their memorandum to Malay representatives of the party and threatened to burn the building. “We want a Chinese to accept our memorandum and not a Malay,” a member of the group said to Selangor DAP official Edry Faisal Yusof and several other Malay members of the party. “The Malays have nothing to do with this,” said another protester. “Do not sell the Malays’ dignity. We do not want Malays to be servants, we do not want Malays to be traitors. The 30-odd activists were led by Mohd Ali Baharom, also known as Ali Tinju. 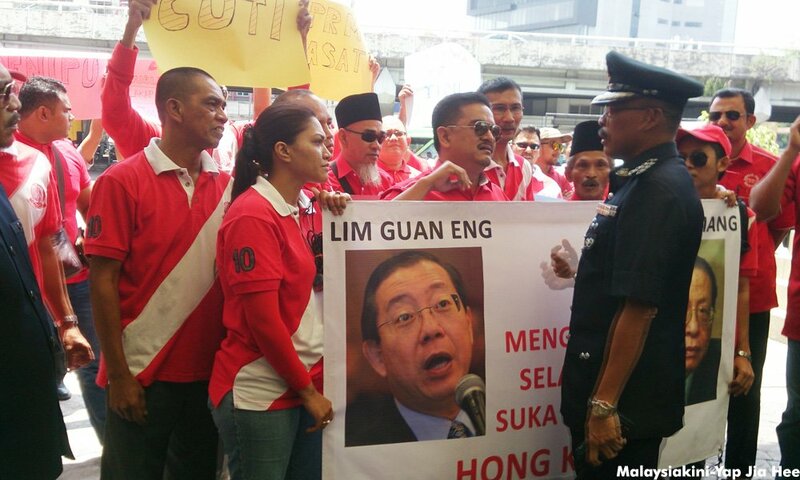 KUALA LUMPUR, March 31 — Mohd Ali Baharom, popularly known as Ali Tinju, and a group of about 20 others stormed DAP’s headquarters today demanding the party take responsibility for a Chinese man’s allegedly disparaging remarks about Islam. According to Selangor DAP committee member Edry Faizal Yusof, Ali Tinju and his supporters told DAP to reprimand the man for his comments on Facebook, saying although the party had no affiliation with the individual, it should be held responsible as he is ethnic Chinese. Edry said he insisted to the group that the man in question had no links whatsoever to the DAP but Ali Tinju persisted. “They came to give a memorandum and he wanted DAP to respect Islam because argument is that there’s a Chinese person mocking Islam but he held DAP responsible for it. “I don’t know who this random guy is but the way they said it is as if, if you’re Chinese and you’re mocking Islam or try to provoke it, then they’ll hold DAP accountable,” Edry said in a phone interview with Malay Mail Online. He said when he tried to accept the memorandum on behalf of the DAP, Ali Tinju refused to surrender it, insisting that a Chinese party member accept it instead. I came down to accept on behalf party but they wouldn’t let me because I’m Malay. “So we got the DAP office manager, who is Chinese, to accept it,” Edry said. Sekumpulan kira-kira 30 penyokong ‘Baju Merah’ diketuai Ali Tinju kecoh di luar Ibu Pejabat DAP hari ini kerana enggan menyerahkan memorandum mereka kepada wakil DAP dari kaum Melayu, Edry Faizal Yusof, sebaliknya berkeras mahu wakil DAP dari kaum Cina sahaja yang menerimanya. Edry adalah salah seorang pemimpin muda DAP yang merupakan Ahli Jawatankuasa DAP Negeri Selangor merangkap Ahli Majlis Selayang sedangkan Yoon Ming adalah petugas pentadbiran. This entry was posted in Uncategorized and tagged Ali Tinju, Ali Tinju leads demonstration again DAP, DAP, red shirts. Bookmark the permalink.